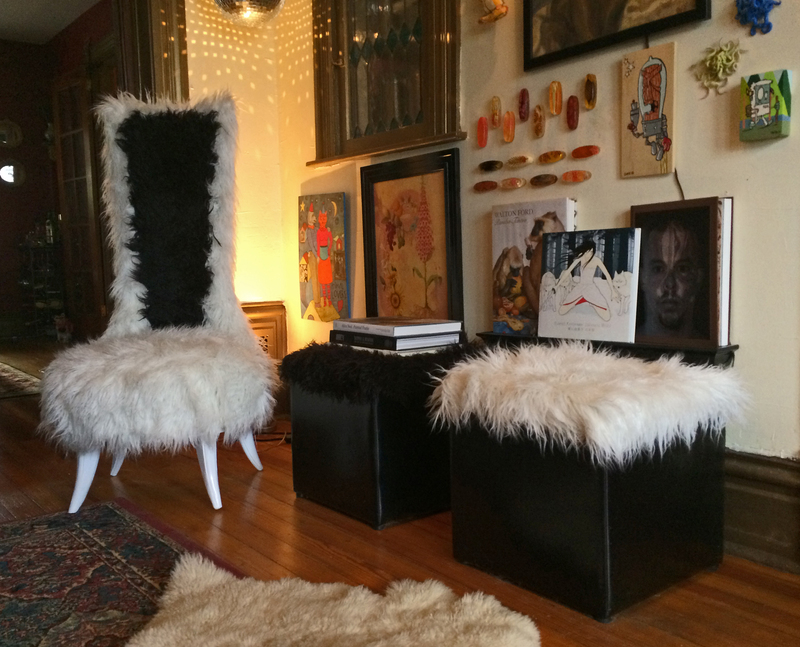 Fun Space-age Faux Fur Chair DIY Make-over on a Found 60’s Chair, plus Furry Ottomans! I had a lot of fun with this one! 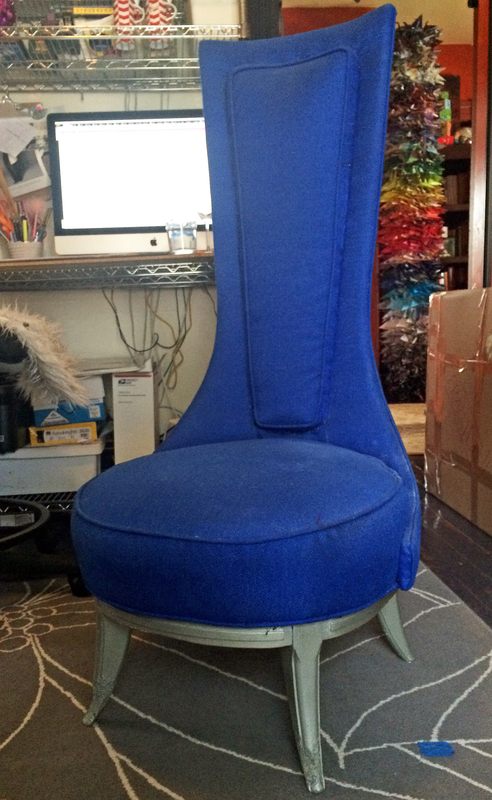 A neighbor who moved left this awesome chair behind. It needed some work, but hey, it was FREE! 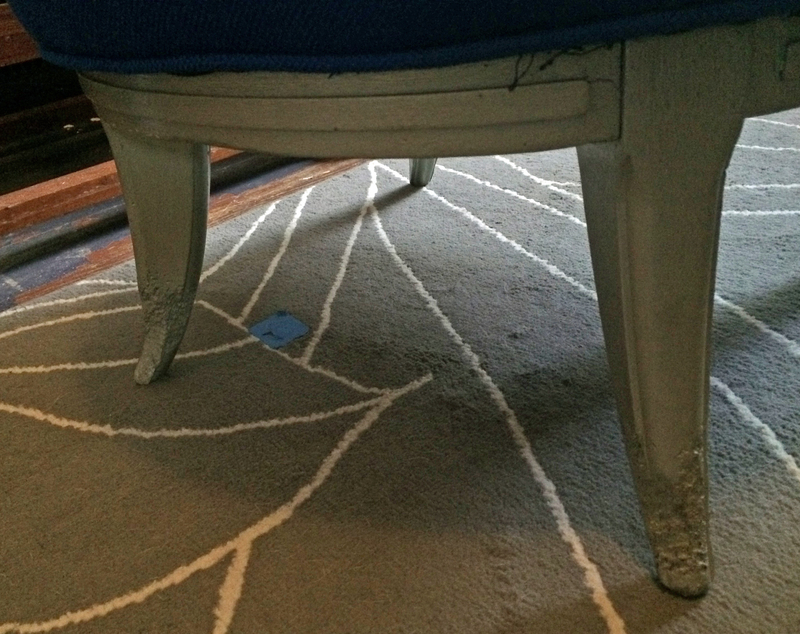 Apparently someone’s dog had made a meal out of the legs, so my first step was to fix them. 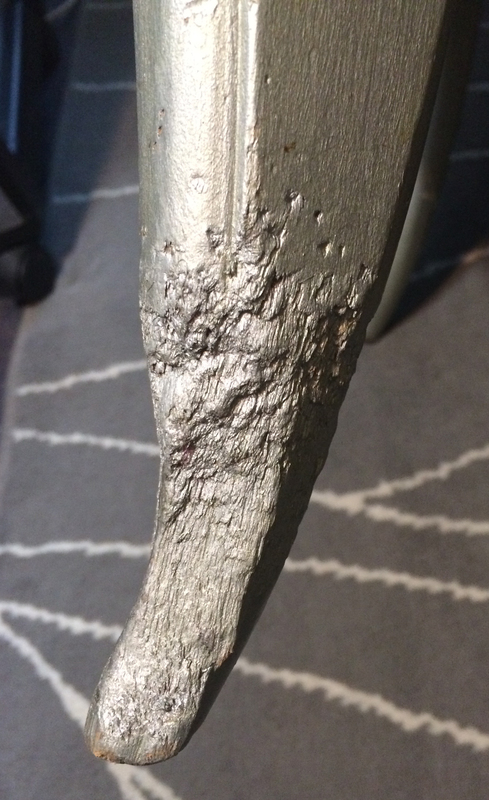 After sanding all the wood, I used Magic Sculpt to fill in the nibbled bits on the legs. Then more sanding after the Magic Sculpt dried. 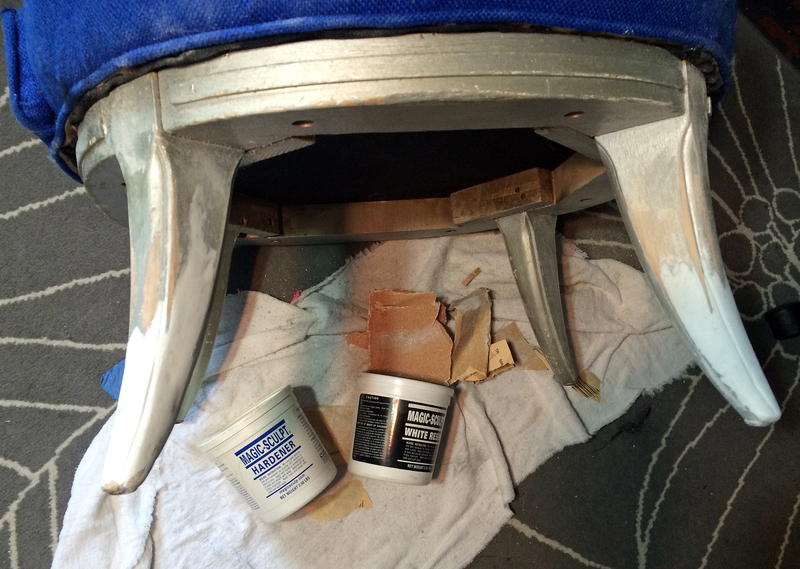 Then I sprayed them with a white gloss paint (primer and paint in one, about 3 coats). 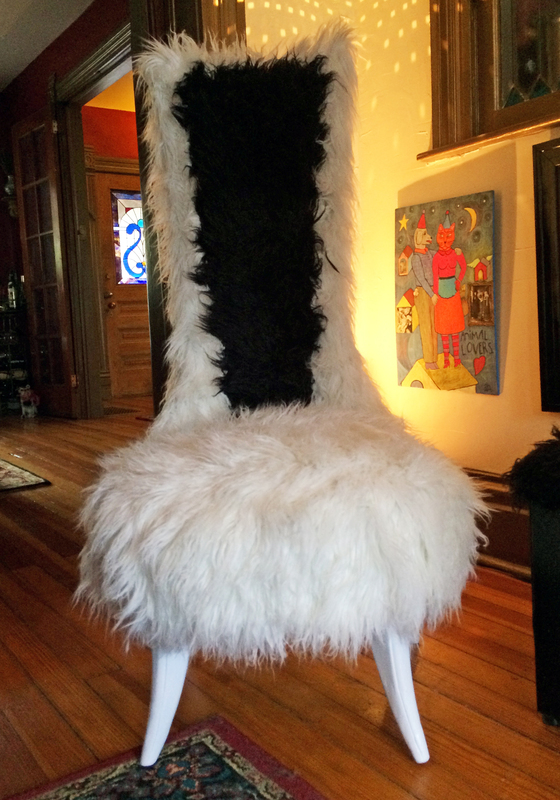 After the paint dried thoroughly, it was time to get furry! 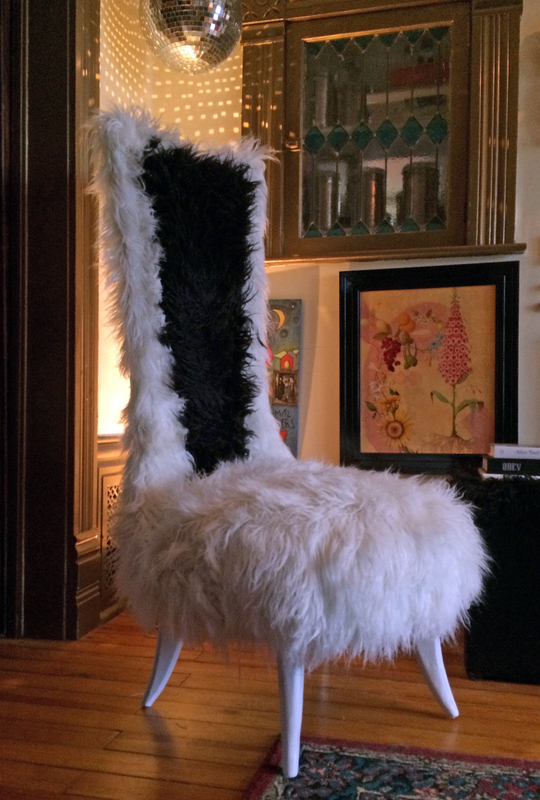 I used a long-pile Mongolian-style faux fur from Distinctive Fabric, combining white and black. 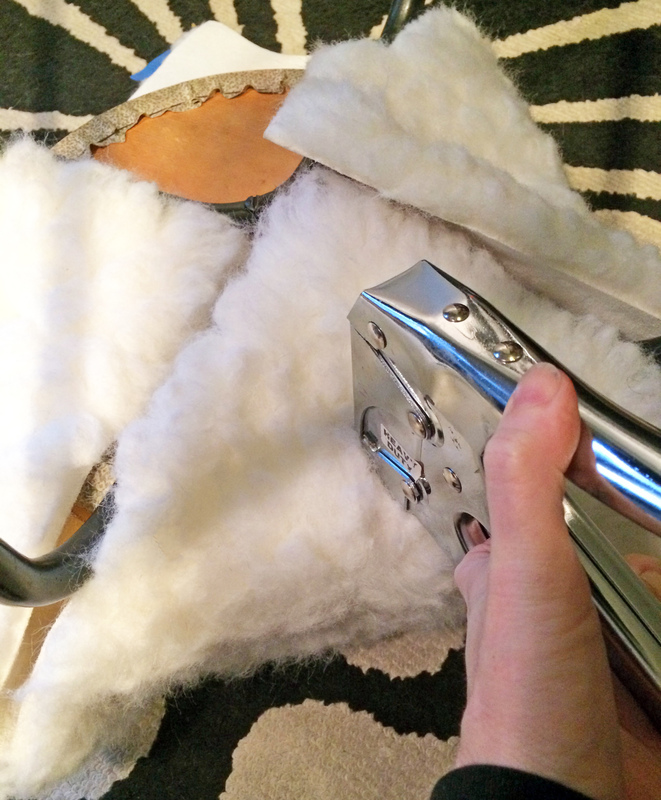 Usually I would use a staple gun, but faux fur loves hot glue, it holds the fur like nothing else. 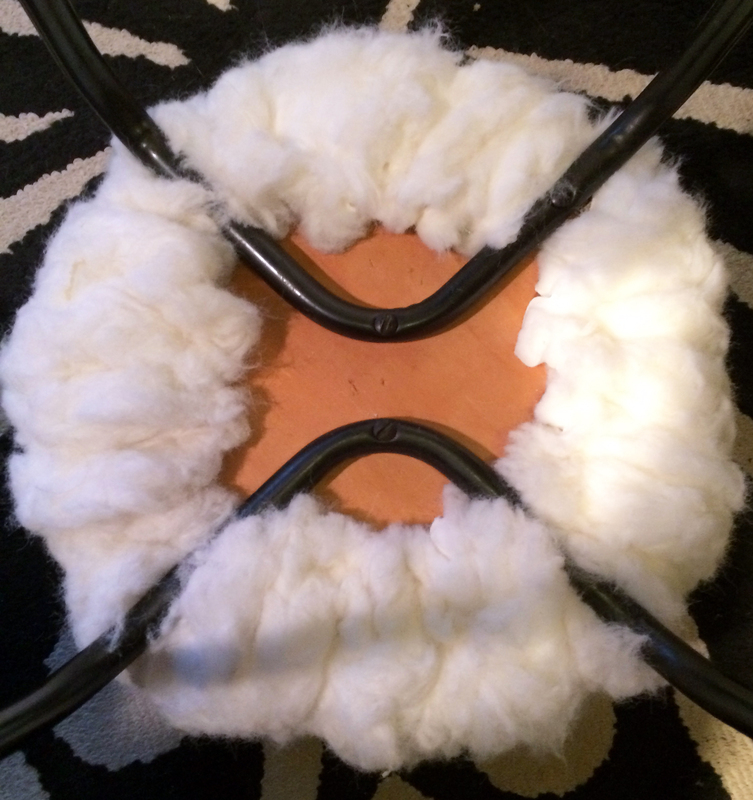 Do be sure about your placement, as you will not be able to separate the fur once it dries. And of course, be very careful. Hot glue burns are no fun. Have a bowl of ice water on hand just in case, it really helps if you do burn yourself. 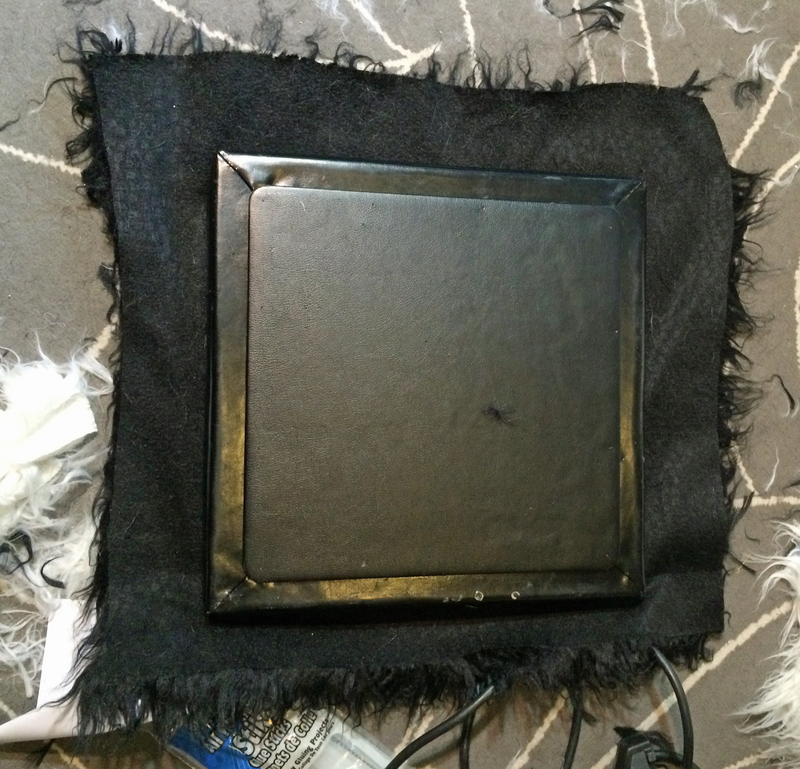 I used an old screwdriver to push the fur into the cracks to avoid burns. 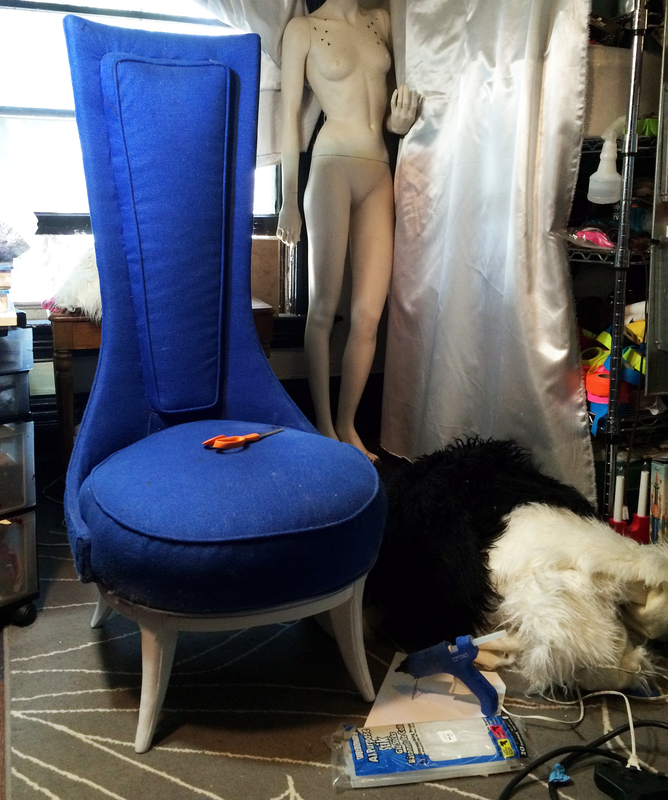 I did the seat first, measuring and cutting the fur in place on the chair. 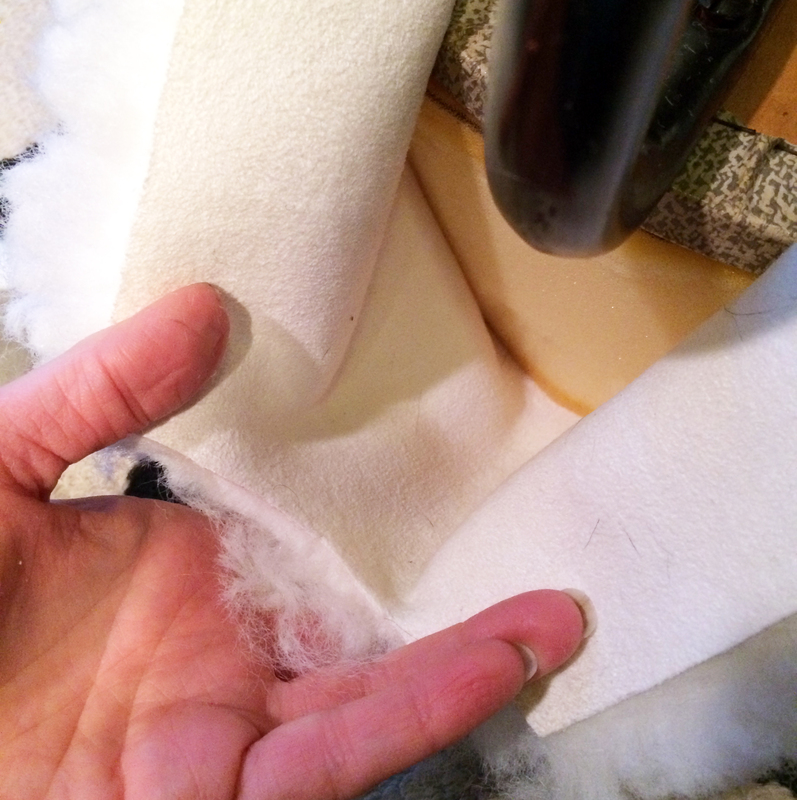 You’ll want to pull the fur away from the backing when you are cutting as much as possible to avoid cutting into too much of the long pile. Fair warning, faux fur is really messy! It will cover everything, including you, so dress appropriately. 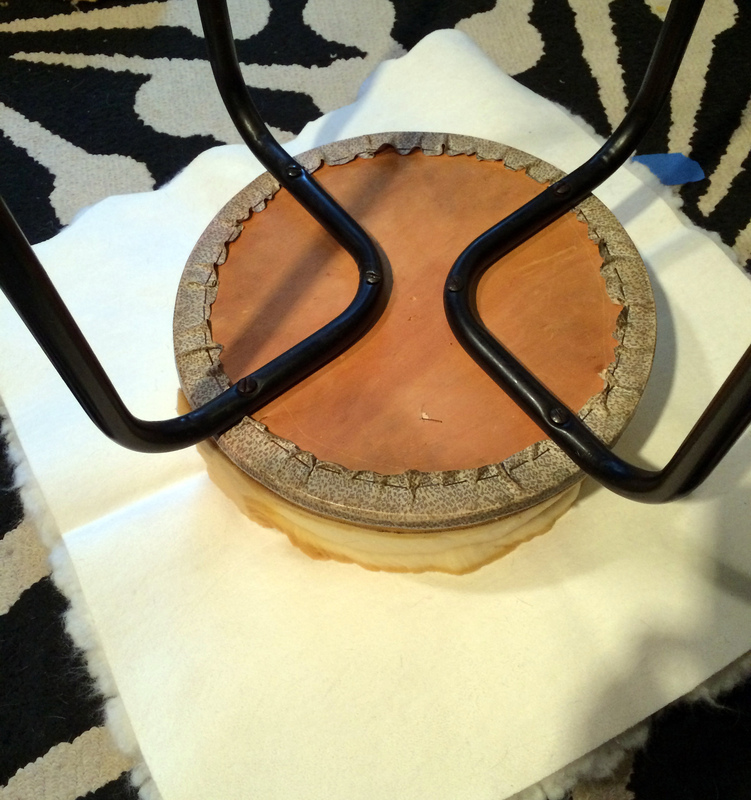 The gluing was actually pretty easy, it just took some time. 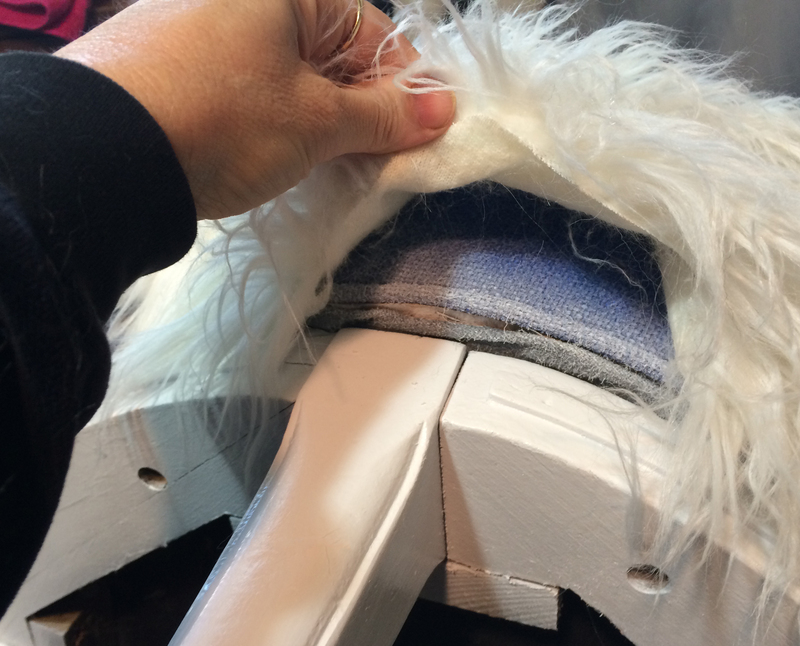 I worked in about 6-inch sections, laying the glue, pulling the fur into place and pushing down to stick it into the fur well. The great thing about faux fur is, the longer stuff covers a multitude of sins, so even a bit of a messy job will look great. And be sure and have a lot of glue sticks on hand, I used about ten long ones. 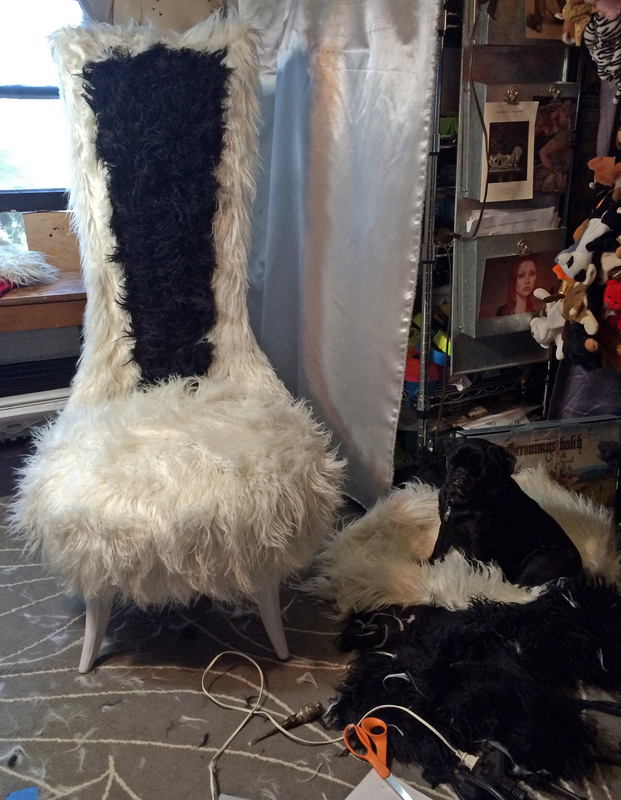 For the upper part of the chair, I pinned the fur into place and then glued it. And it’s done! What a mess. 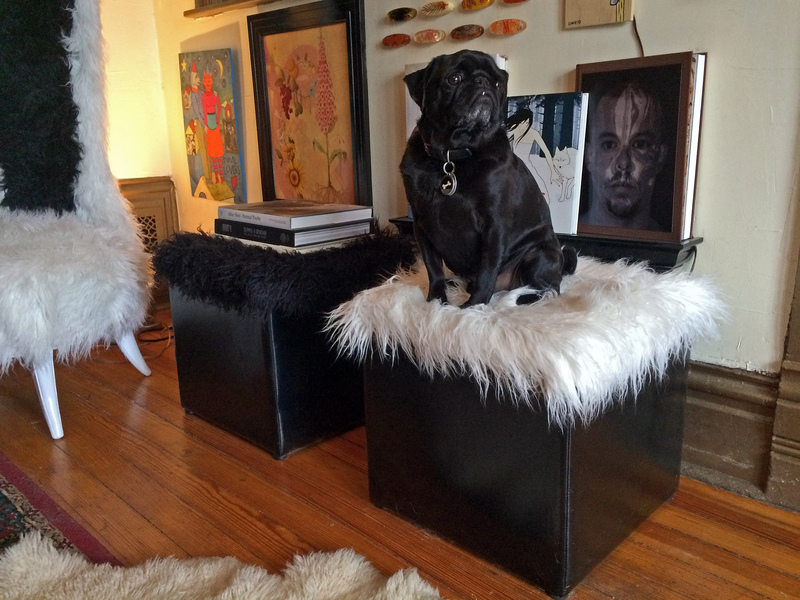 My pug Max doesn’t seem to mind. This was an easy one. 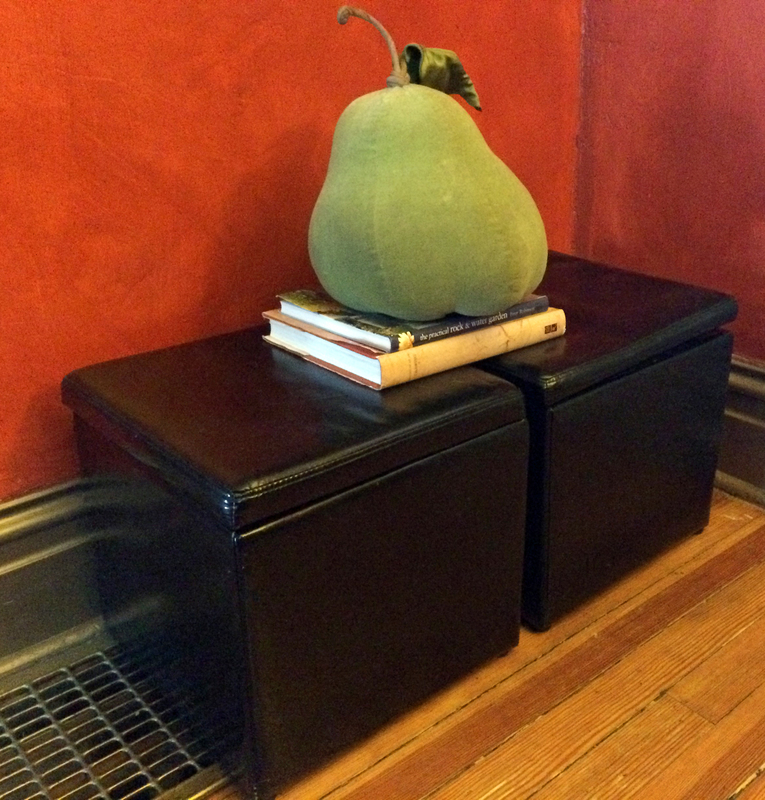 I was tired of the boring black storage ottomans, so I used a staple gun to give them matching faux fur tops. 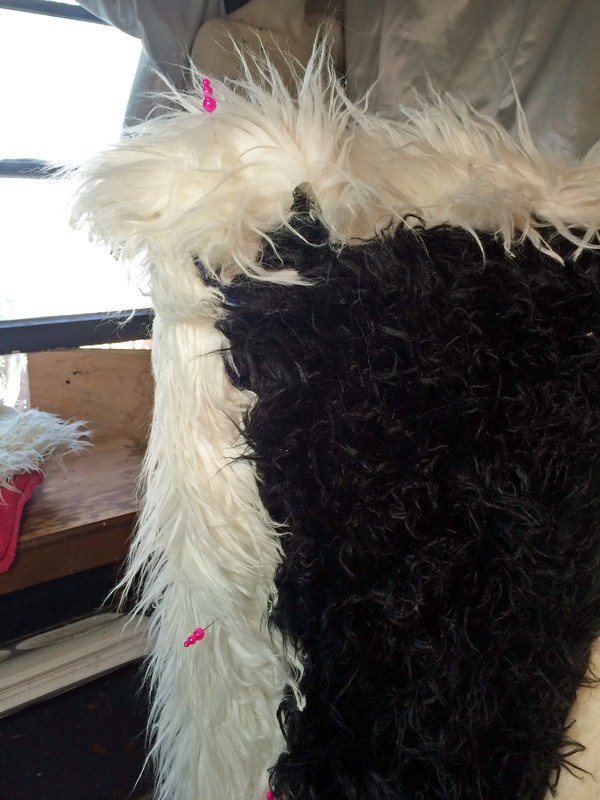 This time I didn’t use the hot glue so I have the option of easily removing the fur in the future if I want. I just removed the tops and stapled fur under the lids. Easy-peasy. And here they are! The pugs love them. 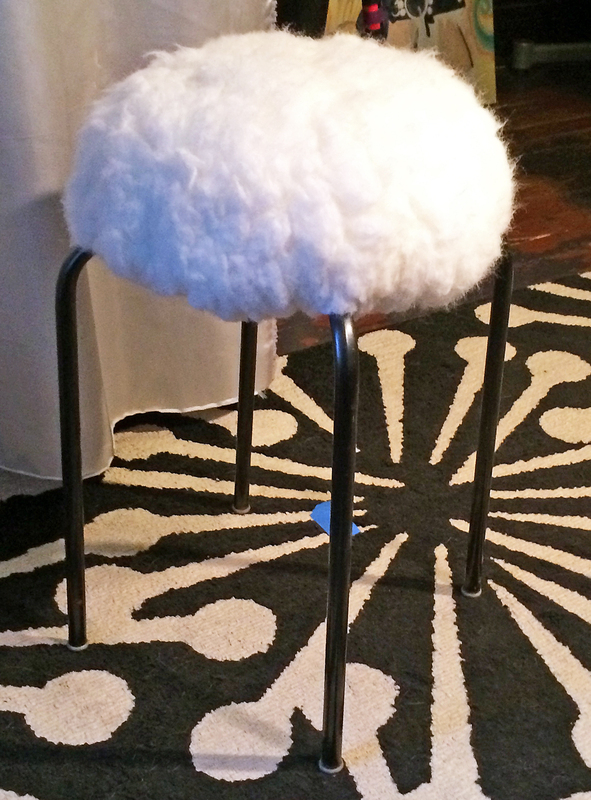 I did a super-quick little make-over on this stool today. It took less than 30 minutes! 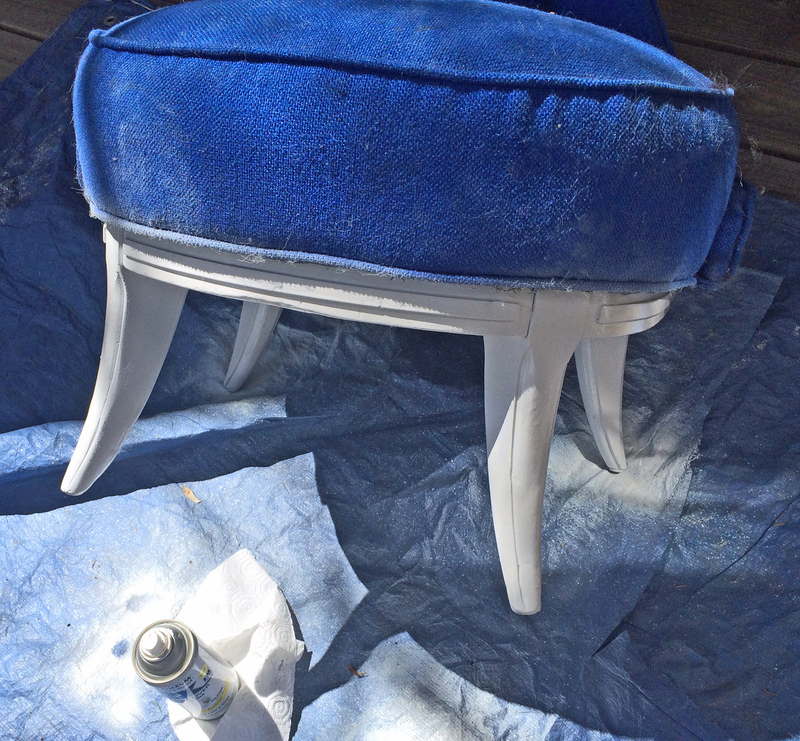 We’ve had this vintage stool in the dressing room for years (it was my boyfriends before I can along so who knows how long he had it) and I’ve been wanting to give it a redo. 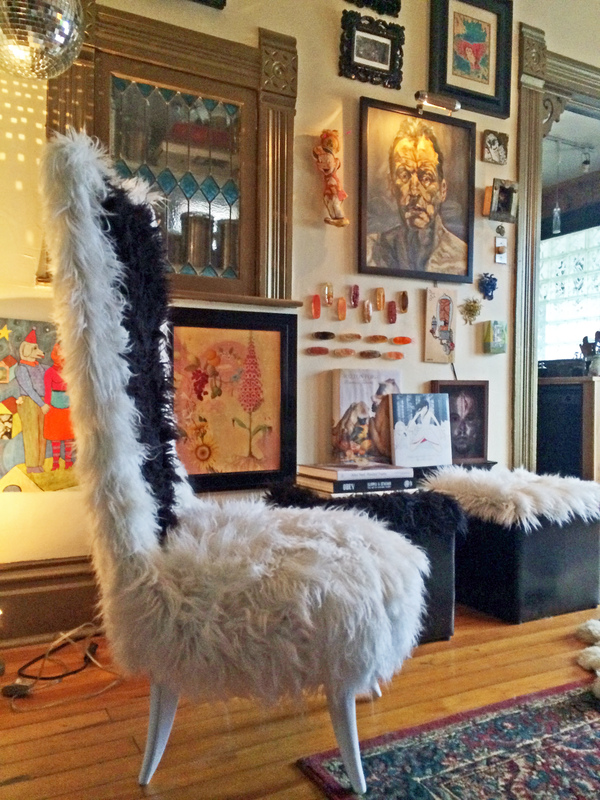 I found this heavy-duty piece of sheepskin-esque faux fur at the thrift store for $2.99 last year and it worked great for this. 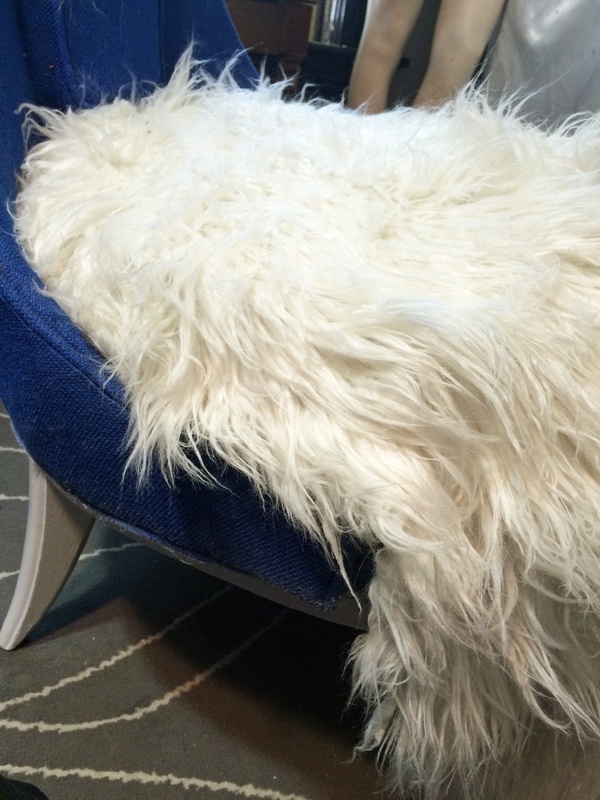 Faux fur is very forgiving for this sort of thing. 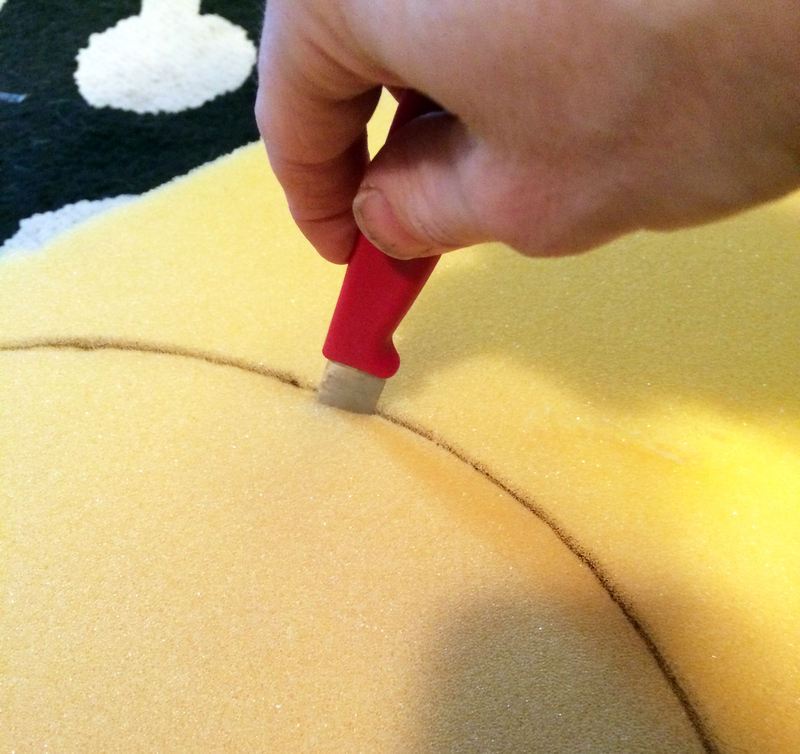 I also had a piece of thick foam leftover from another project that was perfect. 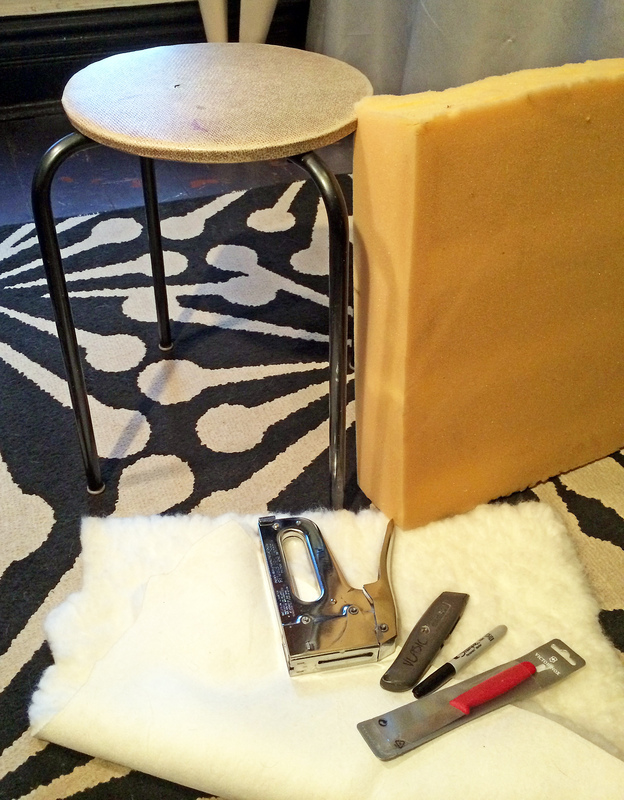 I grabbed my supplies (pen, knife, scissors and staple gun) and went at it. 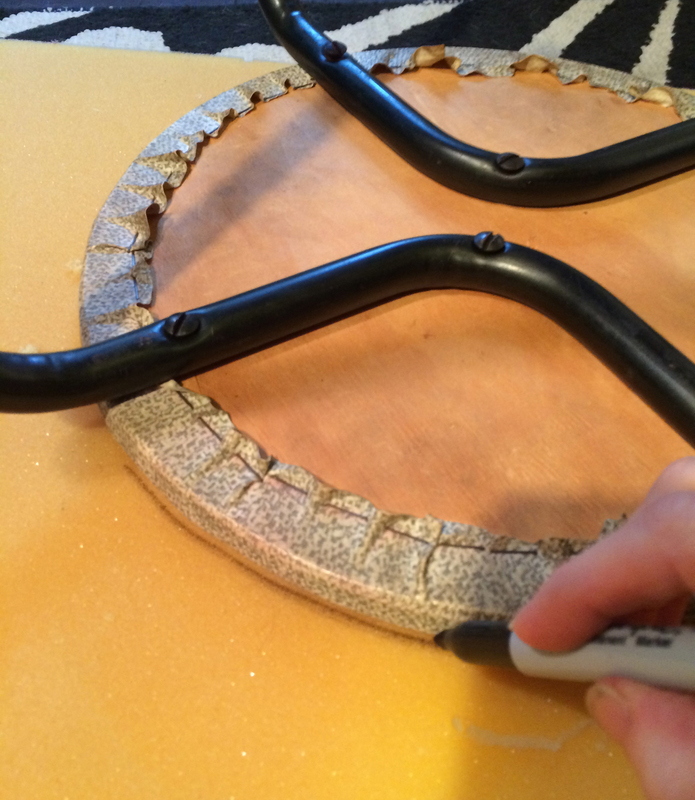 I started measuring the foam by turning the seat upside-down on top of the foam and traced it with a sharpie pen. I started the cut with a utility knife as it gave me more control, then finished it with a sharp knife, slicing with a steady up and down motion. Then it was time to get stapling. 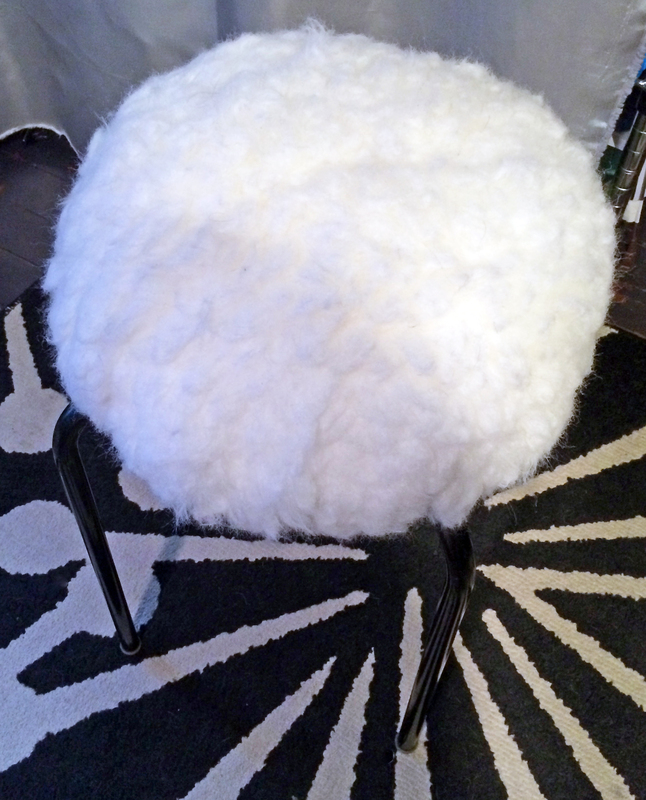 I placed the foam on the stool, then turned it upside-down in the center of the fur. Start by stapling opposite sides, pulling firmly but not tight. 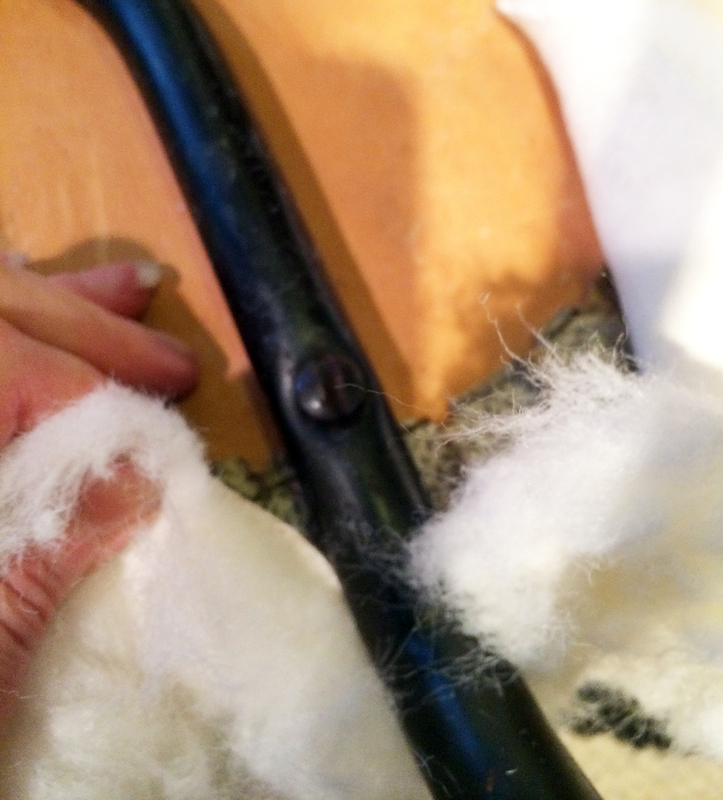 Once each of the 4 sides are tacked down, go to the middle of each tack and staple, again going to opposite sides. 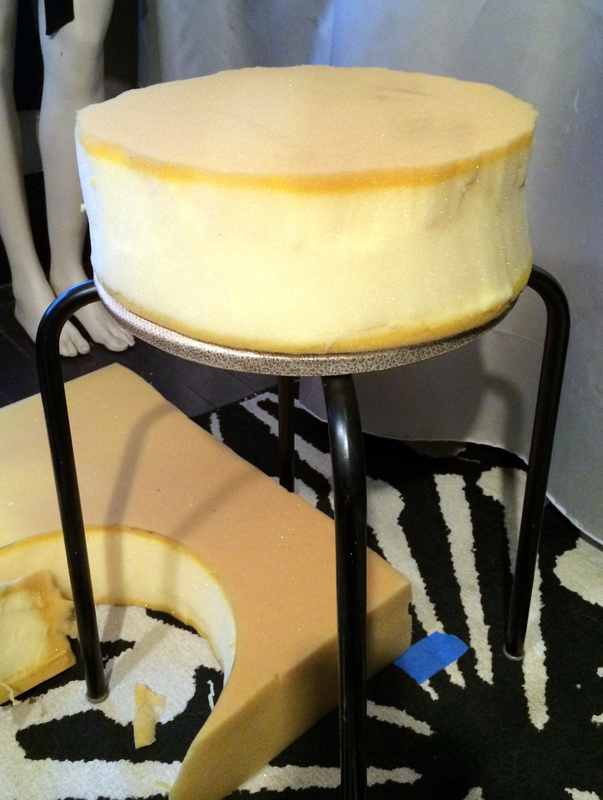 Because of the way the legs sit on this stool, I had to cut in and staple around them. I found the center point, cut a semi-circle where the leg would go and stapled on either side of the leg, again pulling firmly but not tight. Be sure and stop periodically to check that the fabric is fairly evenly pulled all the way around so it’s not lop-sided when you’re done. Then finish it off, going around the outside and tacking down the remaining open bits. Done! This is the first time I’ve ever dyed eggs with beets. First off, fair warning. It WILL dye your hands, (though it wears off pretty quickly) so wear gloves unless pink fingers are your thing. 1. Hard boil the eggs. I used this method http://culinaryarts.about.com/od/eggsdairy/r/Hard-Boiled-Eggs.htm and it worked perfectly, no cracks or issues. Let them cool. 3. Dye your eggs. The longer you leave them in the juice, the darker they will be, just be sure and stir them around from time to time while they’re in there. Place them on paper towels (or a rag you don’t turning pink) to dry. I tried to get fancy with it by creating stripes. It is subtle but it worked. 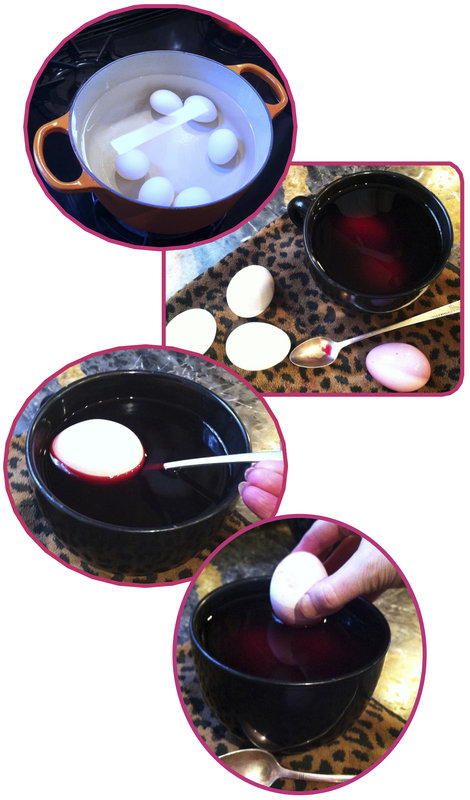 I just held the egg steady in the beet juice at one level, let it dry, then at another level, let it dry, and so on. NOTE: At first I tried to use beet juice from a can of beets. Epic Fail. Just made a mess. Don’t do it. 2. Arrange the display. I choose to use a cute vintage polka-dot bowl that usually sits on my kitchen counter. I put a white faux fur scrap in first, being sure to tuck all the edges under, then added a string of coque feathers tucked in around the fur, and then added the guinea feathers outside the coque feathers. 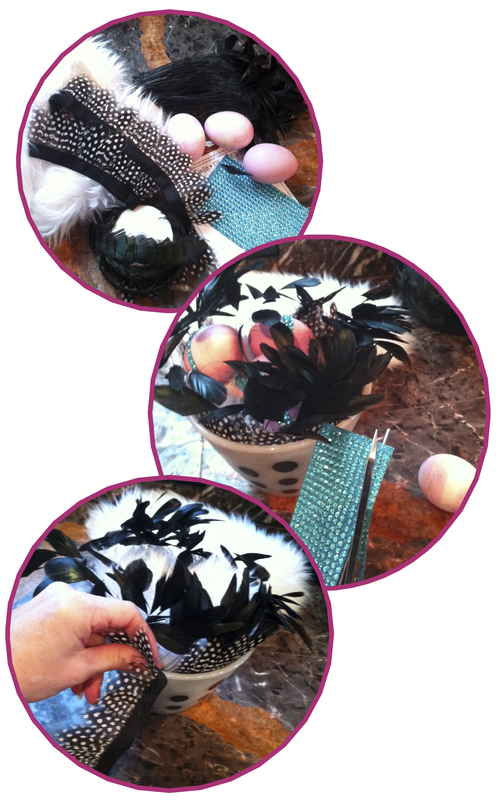 (I keep a bunch of miscellaneous feathers around for decorating projects. They’re great to add to flower arrangements, just alone in a vase, in centerpieces, etc.) 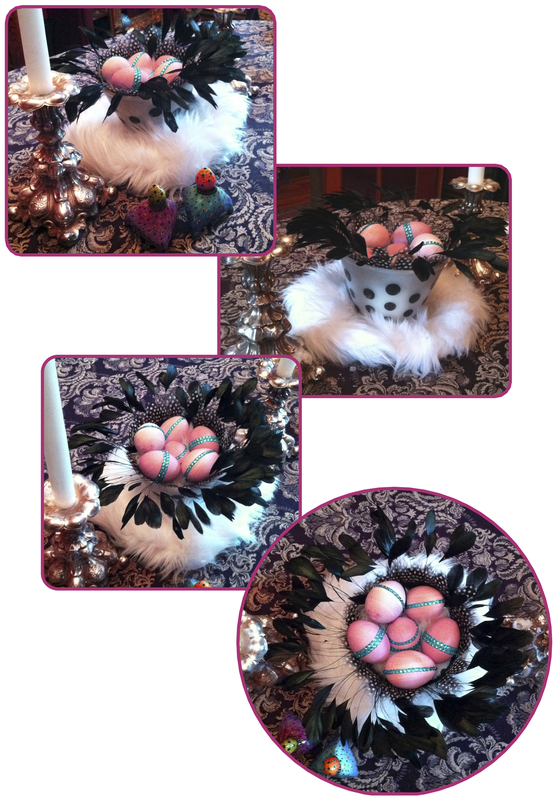 Lastly, the eggs went in the bowl on top of the faux fur, and I set the bowl on top of another faux fur scrap. That’s it! Quick, easy, and well, a little weird I know, but it suits my personality. Everything I used (except the eggs of course) can be reused again. The only things I bought were the beets and the eggs, which will all happily be eaten. 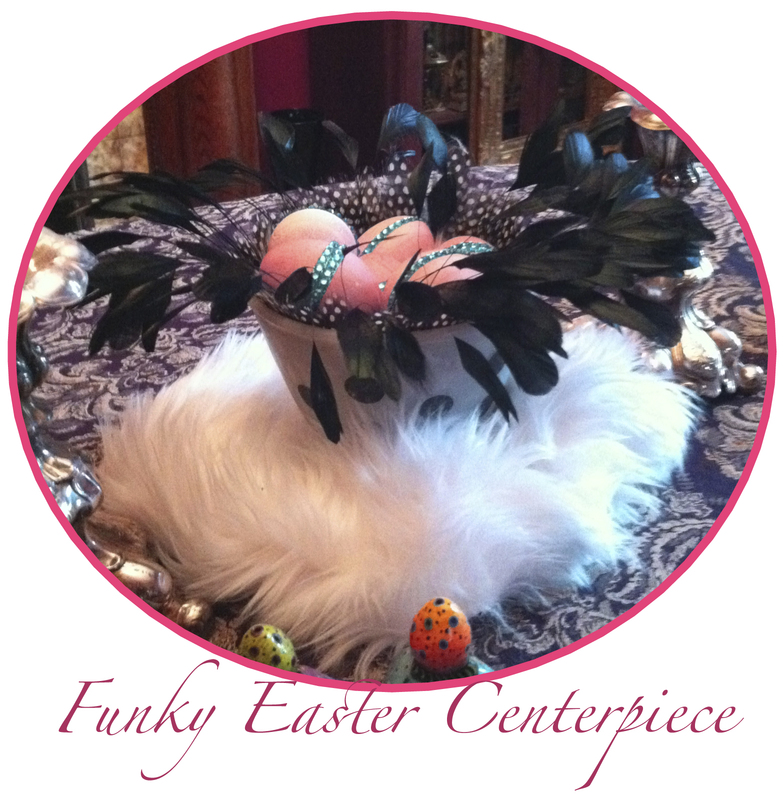 I hope you’ll be inspired to get funky and think outside the Easter box with your project. I’d love to see your funky creations! Please share them in the comments section below. Happy Easter!